I’ve seen a lot of attention lately to restoration of extinct species. It strikes me as a band-aid, not a solution. Critters don’t go extinct for lack of human intervention. They go extinct because the balance of birth and death rates is unfavorable, so that population declines, and (stochastically) winks out. That happens naturally of course, but anthropogenic extinctions are happening much faster than usual. 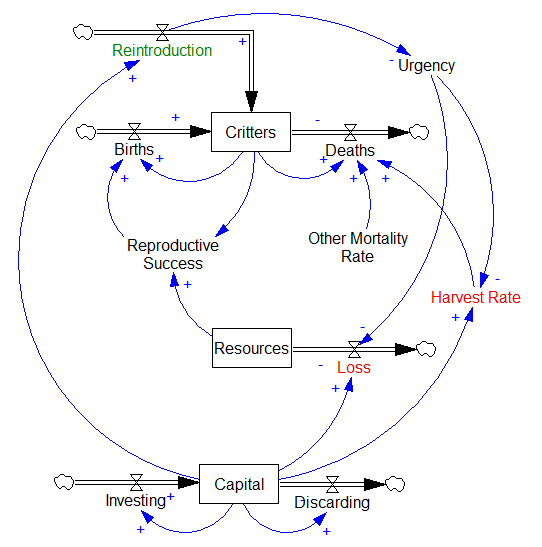 The drivers (red) are direct harvest and loss of the resource base on which species rely. The resource base is largely habitat, but also other species and ecosystem services that are themselves harvested, poisoned by pollutants, etc. Reintroducing lost species may be helpful in itself (who wouldn’t want to see millions of passenger pigeons? 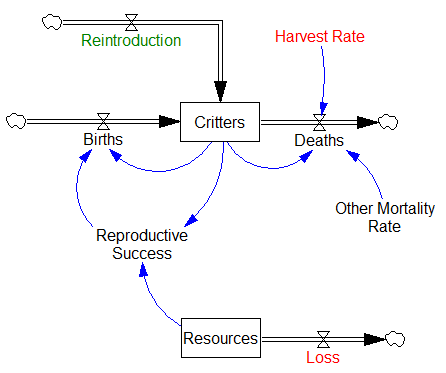 ), but unless the basic drivers of overharvest and resource loss are addressed, species are reintroduced into an environment in which the net gain of births and deaths favors re-extinction. What’s the point of that? If the drivers of extinction – ultimately population and capital growth plus bad management – were under control, we wouldn’t need much restoration. If they’re out of control, genetic restoration seems likely to be overwhelmed, or perhaps even to contribute to problems through parachuting cats side effects. This is not where I’d be looking for leverage. The NYT has an interesting article on the decline of the High Plains aquifer, which includes the famous Ogallala aquifer. 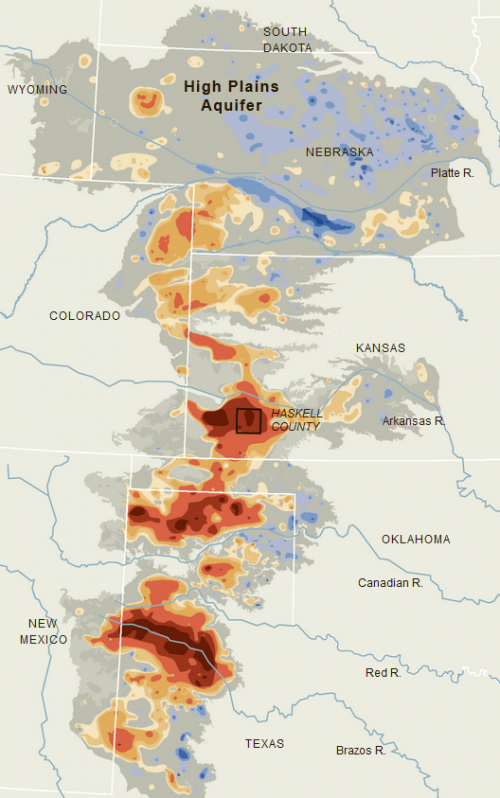 Water tables are dramatically down (red) in many areas, making irrigation impractical. Alternately, as an economist might put it, depletion of groundwater is typically an externality, with zero rent paid from users to owners (us). There are three facets to management of the problem: the commons problem, detail complexity from the complex geology of aquifers, and dynamic complexity. Allocation of property rights solves the commons problem, but not the others (see Erling Moxnes’ interesting work on this). This suggests that there’s some low-hanging fruit to be harvested through provision of simple feedback, as in the Climate Scoreboard. There are warning signs when the active structure of a system is changing. But a new paper shows that they may not always be helpful for averting surprise catastrophes. 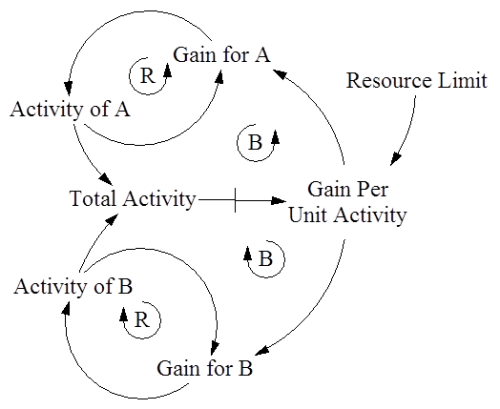 For a = 1, the system has a stable point at stock=0.5. 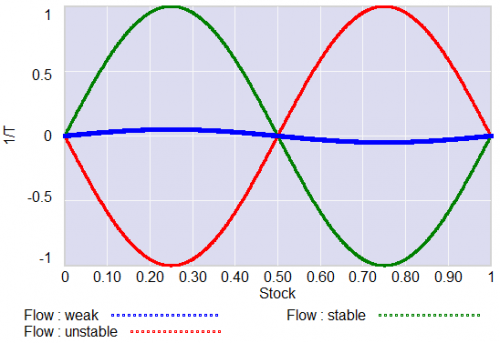 The gain of the negative feedback that maintains the stable point at 0.5, given by the slope of the stock-flow phase plot, is strong, so the stock will quickly return to 0.5 if disturbed. For a = -1, the system is unstable at 0.5, which has become a tipping point. It’s stable at the extremes where the stock is 0 or 1. 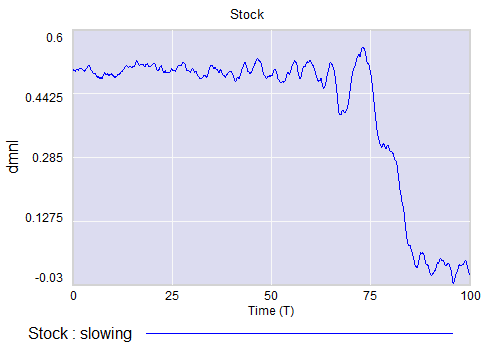 If the stock starts at 0.5, the slightest disturbance triggers feedback to carry it to 0 or 1. For a = 0.04, the system is approaching the transition (i.e. bifurcation) between stable and unstable behavior around 0.5. The gain of the negative feedback that maintains the stable point at 0.5, given by the slope of the stock-flow phase plot, is weak. If something disturbs the system away from 0.5, it will be slow to recover. The effective time constant of the system around 0.5, which is inversely proportional to a, becomes long for small a. This is termed critical slowing down. For a=0 exactly, not shown, there is no feedback and the system is a pure random walk that integrates the disturbance. The neat thing about critical slowing down, or more generally the approach of a bifurcation, is that it leaves fingerprints. Here’s a run of the system above, with a=1 (stable) initially, and ramping to a=-.33 (tipping) finally. It crosses a=0 (the bifurcation) at T=75. The disturbance is mild pink noise. Notice that, as a approaches zero, particularly between T=50 and T=75, the variance of the stock increases considerably. 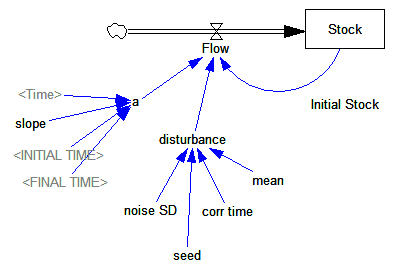 This means that you can potentially detect approaching bifurcations in time series without modeling the detailed interactions in the system, by observing the variance or similar, better other signs. Such analyses indicate that there has been a qualitative change in Arctic sea ice behavior, for example. Now, back to the original paper. It turns out that there’s a catch. Not all systems are neatly one dimensional (though they operate on low-dimensional manifolds surprisingly often). In a multidimensional phase space, the symptoms of critical slowing down don’t necessarily reveal themselves in all variables. They have a preferred orientation in the phase space, associated with the eigenvectors of the eigenvalue that’s changing at the bifurcation. Note that the critical value of the mortality rate is actually passed around time 300, so it takes a while for the transient collapse to occur. Also notice that the variance of the adult population changes a lot post-collapse. This is another symptom of qualitative change in the dynamics. 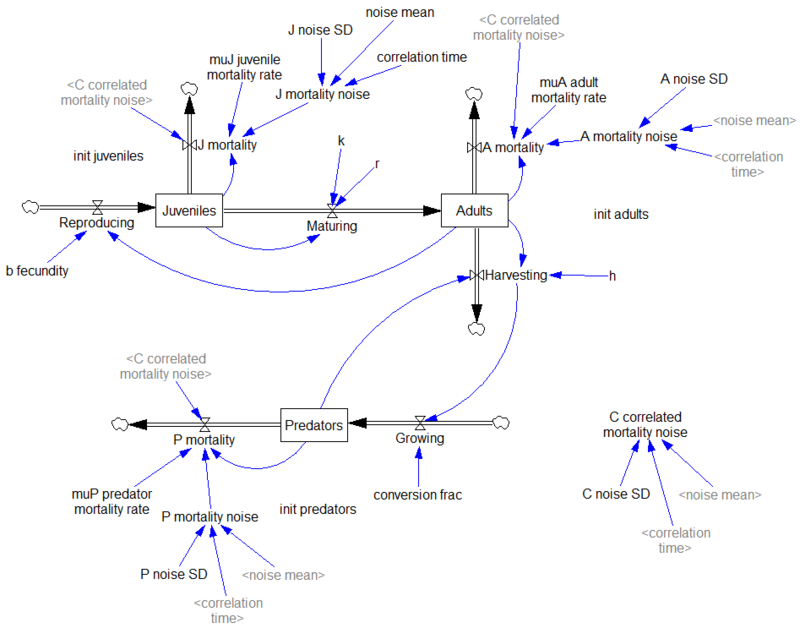 The authors show that, in this system, approaching criticality of the predator mortality rate only reveals itself in increased variance or autocorrelation if noise impacts the juvenile population, and even then you have to be able to see the juvenile population. We have shown three examples where catastrophic collapse can occur without prior early warning signals in autocorrelation or variance. Although critical slowing down is a universal property of fold bifurcations, this does not mean that the increased sensitivity will necessarily manifest itself in the system variables. 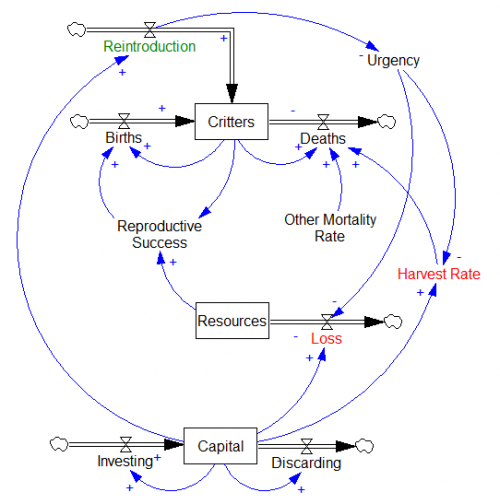 Instead, whether the population numbers will display early warning will depend on the direction of the dominant eigenvector of the system, that is, the direction in which the system is destabilizing. This theoretical point also applies to other proposed early warning signals, such as skewness , spatial correlation , and conditional heteroscedasticity . In our main example, early warning signal only occurs in the juvenile population, which in fact could easily be overlooked in ecological systems (e.g. exploited, marine fish stocks), as often only densities of older, more mature individuals are monitored. Furthermore, the early warning signals can in some cases be completely absent, depending on the direction of the perturbations to the system. They then detail some additional reasons for lack of warning in similar systems. In conclusion, we propose to reject the currently popular hypothesis that catastrophic shifts are preceded by universal early warning signals. 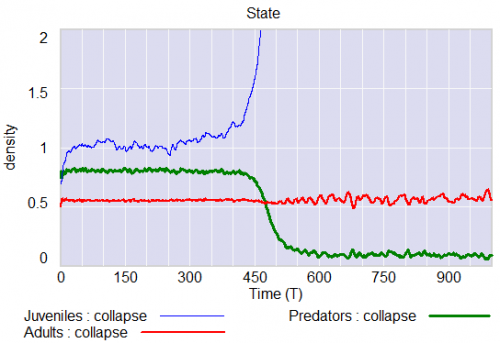 We have provided counterexamples of silent catastrophes, and we have pointed out the underlying mathematical reason for the absence of early warning signals. In order to assess whether specific early warning signals will occur in a particular system, detailed knowledge of the underlying mathematical structure is necessary. In other words, critical slowing down is a convenient, generic sign of impending change in a time series, but its absence is not a reliable indicator that all is well. Without some knowledge of the system in question, surprise can easily occur. I think one could further strengthen the argument against early warning by looking at transients. In my simulation above, I’d argue that it takes at least 100 time units to detect a change in the variance of the juvenile population with any confidence, after it passes the critical point around T=300 (longer, if someone’s job depends on not seeing the change). 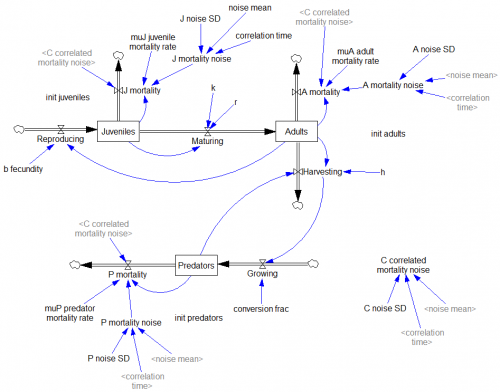 The period of oscillations of the adult population in response to a disturbance is about 20 time units. So it seems likely that early warning, even where it exists, can only be established on time scales that are long with respect to the natural time scale of the system and environmental changes that affect it. Therefore, while signs of critical slowing down might exist in principle, they’re not particularly useful in this setting. The models are in my library. Through the workshops and discussions about the forest economy, we also learned that even raising questions of growth and limits can trigger strong defensive routines …, both at the individual level and the organizational level, that make it difficult even to remain engaged in thinking about ecological limits and, therefore, taking any action. Managing these complex process challenges effectively was essential to using systems modeling to help people move towards well-reasoned action or inaction. … We were presenting our base run to a group of mill executives and landowners from five different companies. During the walk-through of the base-run behavior of mill capacity (which begins to contract severely several decades in the future) we found that a few participants quickly dismissed that possibility, saying, ‘‘Sawmill capacity in this region will never shrink like that,’’ and aggressively pressing us on what factors we had included so that (we presume) they could uncover something missing or incorrect and dismiss the findings. Their body language and tone of voice led us to believe the participants were angry and emotionally charged. … we came to identify a recurring set of defensive routines, that is, both emotionally laden reflexive responses to seeing the graphs of overshoot in which participants did not connect their critique to an underlying structural theory, or simply disengaged from thinking about the questions at hand. … When we encountered these reactions, we found ourselves torn between avoiding the conflict (the ‘‘flight’’ reaction; modifying our story to fit within their pre-existing assumptions, de-emphasizing the behavior of the model and switching to interview mode, talking about the systems methodology rather than implications of this particular model) or by pushing harder on our own viewpoint (the ‘‘fight’’ reaction; explaining why our assumptions are right, defending the logic behind our model). Neither of these responses was effective. Back to the presentation to the industry group. During a break, after we had just survived the morning’s tensions and had struggled to avoid ‘‘fight or flight,’’ Dana [Meadows] walked up to us, smiling, and said, ‘‘Isn’t this going great?’’ ‘‘What?! ?,’’ we thought. I’m at the 30th Balaton Group meeting this week. A group of us just put our heads together to think about online approaches to teaching and sharing systems thinking and systems modeling. The basic question was, if you needed thousands of systems thinkers in a hurry, how could you scale up systems education quickly? Much can already be done through online model services like Forio and other means. However, I think there’s a lot more to be done. In particular, we’re weak on providing shared model transparency and quality control for any but the simplest models. Is London a big whale? Why do cities survive atom bombs, while companies routinely go belly up? There’s another interesting video with West in the conversations at Edge. West looks at the metabolism of cities, and observes scale-free behavior of good stuff (income, innovation, input efficiency) as well as bad stuff (crime, disease – products of entropy). The destiny of cities, like companies, is collapse, except to the extent that they can innovate at an accelerating rate. Better hope the Singularity is on schedule. Thanks to whoever it was at the SD conference who pointed this out! Author TomPosted on August 2, 2011 Categories Sustainability, SystemDynamics, TechnologyTags cities, complexity, network, scale free1 Comment on Is London a big whale? Why is the arctic brown? I’m blogging from a 757, somewhere over the North pole, returning from a sustainability meeting in Iceland. The world below is a wilderness of sea ice and clouds. I’d expect brilliant white, but there’s actually a brown haze over the landscape. It’s stratified, much like the odd sight of half-white, half-brown clouds one occasionally sees when flying into a polluted city. Where does it come from? Chinese coal fumes? Russian fires? American SUV tailpipes? Icelandic airplane exhaust? Author TomPosted on September 20, 2010 Categories Aside, Balaton, SustainabilityTags arcticLeave a comment on Why is the arctic brown? My hypothesis is that the de facto policy for managing water levels is to wait for good years to restore the excess withdrawals of bad years, and that demand management measures in the interim are toothless. That worked back when river flows were not fully subscribed. The trouble is, supply isn’t stationary, and there’s no reason to assume that it will return to levels that prevailed in the early years of river compacts. At the same time, demand isn’t stationary either, as population growth in the west drives it up. To avoid Lake Mead drying up, the system is going to have to get a spine, i.e. there’s going to have to be some feedback between water availability and demand. To slow the lake’s years-long decline, river users have built a reservoir west of Yuma to catch unused runoff, paid farmers to leave fields unplanted and are negotiating with Mexico to leave some of its allocation in Lake Mead while its farmers recover from an earthquake. None of the steps will yield significant amounts of water, but together, they could keep Lake Mead from sinking below the drought triggers, buying time until a wet winter can replenish some of the water lost to drought.